Pristine bottles straight from a cellar. 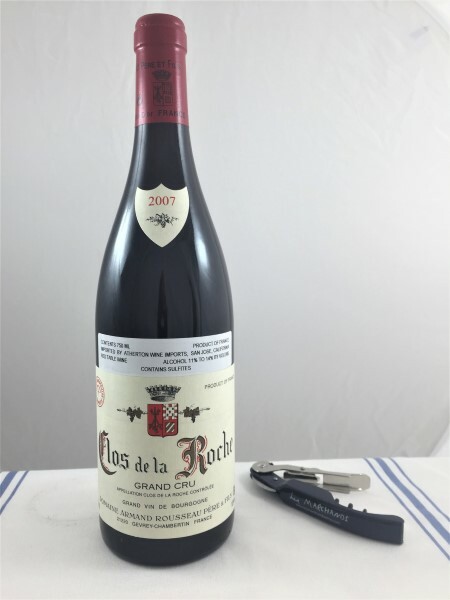 Charles Rousseau's son Eric, who makes the wines and has now largely completely taken over all of the day to day management duties, calls 2007 "one of those strange vintages where the hottest month of the growing season was April. Things were so far in advance that even with the cool and wet summer that according to the 100 day rule of thumb, we thought that we would harvest around the 20th of August. There was so much rain though that it retarded the maturities and I remember noticing that only the weekends were nice, which meant that you had to be out treating the vines when you could. It would be fair to say that there were very few off days in 2007. However, beginning around the 10th of August, good if not really hot weather arrived and when we began picking on August 31st, the harvest weather was ideal. There was some rot that had to be eliminated as well as some under ripe berries. Sugars were good at between 12 and 13% as were acidities. Phenolic maturities were also good, probably because the number of days between flowering and harvest made 110, which normally will give you good phenolic maturity even in average vintages. As such, I did a normal vinification that went according to Hoyle as there were no problems and the malos were finished by March. Overall, 2007 is a very good vintage and certainly better than 2006." Tasting note: A notably riper nose features more classic aromas of red and blue pinot fruit, violets, underbrush and this too offers a hint of jerky that complements the lightly spiced, rich, full and delicious medium weight plus flavors that possess an appealing textured quality to the energetic, sappy and mouth coating finish that is both balanced and impressively long. Excellent quality here and while not ultra powerful, this is certainly a step up in muscle compared to the Charmes and Mazis.